WHY CHOOSE DAVID FOCKLER & ASSOCIATES, INC.? QUALITY SERVICE We consider our business a "private practice" and as a result a partner of the firm completes the entire search process; no delegation to "assistants". We call this THE PARTNERSHIP APPROACH. THE PARTNERSHIP APPROACH is a continuing relationship between the executive search partner, client, and candidate, while the partner stays abreast of the client company�s progress and developments. 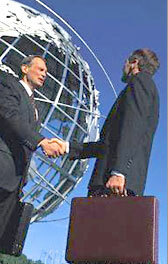 Then DAVID FOCKLER & ASSOCIATES, INC. can immediately initiate a search when an opening occurs. EXPERIENCE Because we have been developing clients and candidates since 1973, our resources are the best in the recruiting industry!! SPEED Recruiting is our ONLY business. All of our resources are concentrated on the unique recruitment needs of each client and candidate resulting in each search being completed in a timely manner. CONFIDENCE Preserving the confidentiality of our clients and candidates is of critical importance to us; our reputation depends on it! !